Aspiring entrepreneurs looking to start or grow a small business have a valuable on-campus resource in the Missouri Rural Enterprise and Innovation Center (MREIC). MREIC, established in 2006, is a non-profit innovation center sponsored by the Missouri Department of Economic Development and local partners, including Truman. Its purpose is to serve as a catalyst for economic development, with particular emphasis on start-up businesses and established firms that are involved in the life sciences and information technology. It specifically focuses on the needs of rural communities and rural business enterprises across Missouri, especially in the northern half of the state. The ultimate goal of MREIC is to generate and provide resources to assist innovators, entrepreneurs and existing businesses in the transition of their ideas into successful business ventures and expansions, thereby supporting the economic development of rural portions of Missouri. MREIC works in collaborations with various organizations and economic development teams to leverage resources and better serve the entire region. One on-campus partner is the Small Business Development Center, which shares office space with MREIC in Violette Hall. Truman’s SBDC is part of a nationwide network, and one of several that MREIC collaborates within the state. The SBDC provides counseling in such areas as business plan development, financial management, market feasibility, international trade, franchising and licensing, inventory, marketing and more. In the last year MREIC made contacts with 542 clients. Currently 34 clients are actively pursing business expansions or business start-ups. MREIC’s efforts have translated into five new business ventures and the creation of 10 new jobs. MREIC resources are available to everyone. Clients have included individuals and even students interested in starting their own business. MREIC currently is supporting the start-up of client ventures with products ranging from food innovations to construction components, and from products with military applications to those for information-intensive security systems. Other recent notable achievements from MREIC include work on 12 collaborative training programs, approval of two proposals for external funding from the USDA and the University of Missouri Extension, and the launch of MREIC’s interactive, data-base driven website at http://www.mreicenter.org. Individuals interested in receiving guidance from MREIC can go online or can call the MREIC Hotline, open 8:30 a.m.-4:30 p.m. Monday through Friday. Tru-Positions will provide a comprehensive database of existing scholarship service, institutional and work study positions, including job descriptions and transferable work skills. This is an important advancement over the current process of requiring students to independently locate a student employment or service position with minimal direction or support. The graphic design group AIGA is creating green goods to sell at the Red Barn Arts and Crafts Festival later this fall. Members of the group are collecting donations of unwanted T-shirts and plastic shopping bags this summer for use in the creation of their goods once school starts. Funds generated by sales of AIGA’s recycled products will be used for graphic design-related trips. Anyone wanting to donate T-shirts or bags is encouraged to contact Megan Dowdy at mmd340@truman.edu. Five Truman students received national recognition at the Phi Beta Lambda National Leadership Conference, which took place in Anaheim, Calif., June 20-23. During the Awards of Excellence program, Alicia Stewart and Brandon Wehmeyer placed first in Parliamentary Procedures, receiving a scholarship of $500 sponsored by the National Association of Parliamentarians. 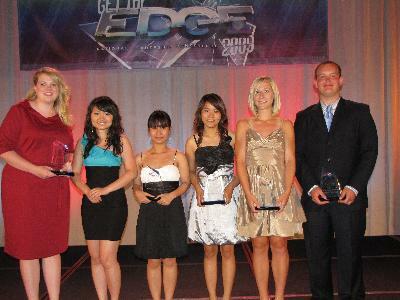 Truman students (from left to right) Alicia Stewart, Daniela (Duong) Dinh, Anh Huynh, Salisa Suwanprathip, Brianna Bernardy and Brandon Wehmeyer at the Phi Beta Lambda Awards of Excellence on June 23. Anh Hunyh received first place in Business Law, while Brianna Bernardy placed fourth in Hospitality Management and Salisa Suwanprathip placed sixth in Macroeconomics. The awards were part of a comprehensive competitive events program sponsored by the Future Business Leaders of America-Phi Beta Lambda (FBLA-PBL). Individuals, state teams and local chapters were encouraged to compete in any of the more than 50 different events representing a wide range of activities and the business and leadership development focus of FBLA-PBL. FBLA-PBL is a non-profit education association with a quarter million members and advisors in 12,000 chartered middle school, high school and college chapters worldwide. Academic OneFile. A source for peer-reviewed, full-text articles from the world’s leading journals and reference sources, with extensive coverage of the physical sciences, technology, medicine, social sciences, the arts, theology, literature and other subjects. Millions of articles are available in both PDF and HTML full-text. Includes full-text coverage of the New York Times back to 1995. Updated daily. Business & Company Resource Center. A source for business, company and industry information. Contains company profiles, periodical articles, financial data, market research, and stock and financial information. Small Business Resource Center. Information on how to start, finance or manage your small business. Resources include sample business plans, how to guides, articles and websites. This hilarious spoof of the best of Agatha Christie traditions is set in a country manor house in the 1930s, with an assembled cast of characters guaranteed to delight. The play introduces the inept and bungling Inspector Pratt, who battles against the odds to solve the murder of the house’s owner. It soon becomes clear that the murderer isn’t finished yet, but will the miscreant be unmasked before everyone else has met their doom, or will the audience die laughing first? July 27-31 11 a.m.-2 p.m.
Aug. 3-7 11 a.m.-2 p.m.
Aug. 10-14 11 a.m.-2 p.m.
Aug. 17-21 11 a.m.-2 p.m.
(Sneak Peak Tours Only) 11 a.m.-3 p.m.
Aug. 23-25 11 a.m.-7 p.m.
Aug. 26 11 a.m.-11 p.m.
Everyone is invited to attend this annual presentation, which is the culmination of the research projects conducted by Truman McNair Scholars during their 10-week summer internship. Visit http://mcnair.truman.edu for the schedule. Print jobs can be made from hard copies or by e-mailing a PDF file to Cathy Sherrow at csherrow@truman.edu. The best usage for this copier is small quantities because it is not a large production machine. All large number items and sizes larger than 11x17 must still go on the press. Allow the standard 4-day turnaround time for the color copier. Publications in Kirk Building, or Fine Arts Publication in Ophelia Parrish, can assist in designing projects and can send them directly to Printing Services. To coincide with the start of the school year, the next issue of the Truman Today will be e-mailed Aug. 27. Print copies will be delivered Aug. 31. Submissions should be made by 5 p.m. Aug. 24. The Truman Today will begin regular Tuesday publications Sept. 8. Biology faculty members Zhong Ma, Cynthia Cooper and Diane Janick-Buckner, along with mathematics and computer science faculty member Hyun-Joo Kim, had their paper, “A Study of Rubisco through Western Blotting and Tissue Printing Techniques,” published in the CBE Life Science Education Journal. Featured on the cover page, the work involved Truman students in Cell Biology (Biol 200) of fall 2008, and was assisted by Deborah Hudman and Julie Lochbaum at the University’s Center for Teaching and Learning. ITS staff members Amy Nunan, Julie Hanes and Diane Richmond attended one of the country’s largest education technology and a/v equipment conferences, EduComm/InfoComm, which took place in Orlando, Fla. The conference, hosted by University Business magazine, featured many renowned keynote speakers including: technology pundit David Pogue from the New York Times; the creators of Schoolhouse Rock; and a panel discussion on Cloud Computing with members from Google, Microsoft, Cisco, Amazon and AT&T. The Truman staff members attended several educational sessions and an expansive trade show seeking further information to guide the academic technology enhancements going on this summer at the University.